2015 Renault Duster Explore is available in the RxL variant only. The 85 PS RxL Duster Explore is priced at INR 9.99 lakh while 110 PS RxL Explore costs INR 11.10 lakh (ex-showroom, Delhi). Renault India launched the Explore Edition of their hot selling SUV Duster. Renault Duster Explore edition comes with major of cosmetic changes than mechanical changes. 2015 Renault Duster Explore edition gets smoked headlamps, a bumper integrated bull bar with fog lamps (one of the aftermarket accessory), anthracite alloy wheels and lots of sticker work. The sticker work is exactly where Duster AWD gets stickers of AWD and right behind the C-pillar. Other than sticker work there is also a chrome strip darkened on front grille and rear one. Under the hood the power train remains same. The SUV continues to get 85Ps and 110Ps options with same 1.5 k9k diesel engine. The SUV is available only in diesel variants of Duster. 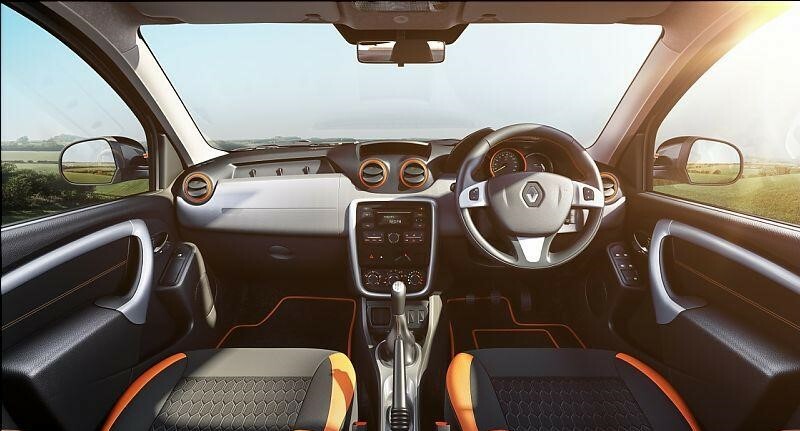 On the interior side, 2015 Duster Explore edition gets a dual tone seat and the chrome bits in interior are replaced by matt orange colour. The Limited Edition Duster Explore feature segment leading features like Eco mode, Gearshift indicator and Cruise control with speed limiter, amongst others. With lot of competition coming in segment that is essentially grabbing shares of Duster in the market. This is just another attempt by Renault India to get sales going again with 2015 Duster Explore Edition.